"Nobody Doesn't Love Santa Fe!" This amazing place is a magnet for artists, tourists, and, of course, photographers. Cameras are as common as red and green chile. 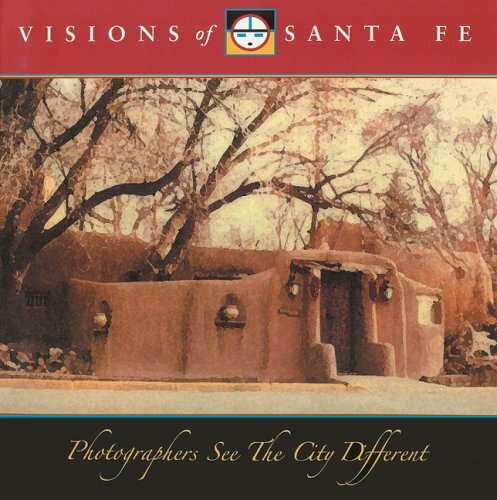 Because Santa Fe is so photogenic, it seemed only natural to produce a book featuring a sample of the infinite number of photographs taken here every year. Yet Visions of Santa Fe is more than simple a collection of pretty pictures. It is a celebration of a place where art and artists are everywhere, and where creativity and eccentricity are honored. It is also a salute to photographers and the art of photography itself. Each of the 75 photographers who contributed images offered his or her own vision of what it means to discover Santa Fe. In Santa Fe there will always be visions, as individual and unique as those who live them. Please note that in this case "hardbound" denotes slip-cased copies of the softbound book and not a traditional board-bound printing. The slip case is cloth-covered, with an image of the book's cover affixed to the case.